Marvel's been setting up Doctor Strange since Winter Soldier - there's been another entire Captain America movie since then! The only character with a longer percolation has been Thanos, and he's the major villain of the entire Marvel Cinematic Universe. I guess they realized that he's so far out of the ordinary milieu that they had to ease audiences into the idea of magic. Doctor Stephen Strange was a world-famous surgeon until a car accident robbed him of the use of his hands and took away his skills. When traditional medicine failed him, he was forced to look for healing, and hope, in an unlikely place. Meeting The Ancient One, who introduced him to the unseen world, Doctor Strange learned about the mystic arts and their unbelieveable possibilities. He also learned that there is a battle against unseen dark forces bent on destroying our reality. Dr. 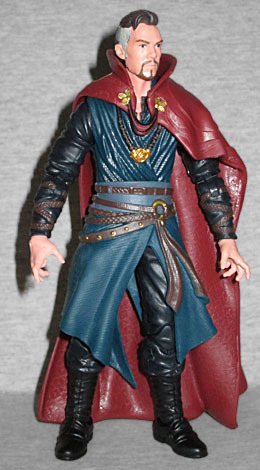 Strange is played by Benedict Cumberbatch, and this figure has a quite impressive facial sculpt. After various terrible attempts at actor likenesses, this one is great! You can instantly recognize Bandicoot Cabbagepatch's lutrine features, even more than on that Sherlock figure released last year. His hair is combed to the side, he's graying at the temples, and he has a thin goatee - like Tony Stark, comicbook Stephen Strange originally just had a mustache, but clearly Bumblebee Candlestick is going for a more modern look. Shame, really: it would have been a chance for the two characters to look more distinct (not that Buttercup Animorph really looks very much at all like Robert Downey Jr, but you get the idea). The movie costume does what the best MCU costumes do: takes the comic design and gives it a slight "real world" tweaking so it doesn't look like it's trying to look like a costume. So Dr. 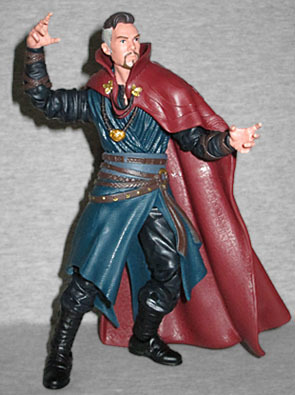 Strange has studied ancient mystical arts? His costume looks like a monk's robes, all made of thick, folded material with a rough texture to it. 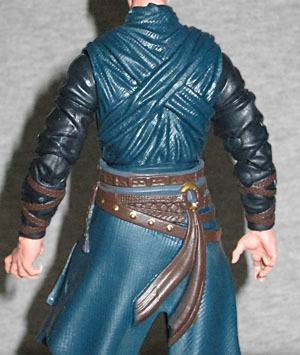 He wears darker clothes beneath that, and holds everything in place with what appear to be five separate belts. There are braided wraps around his forearms, and straps encircling his boots. This isn't a perfect copy of the real movie costume, due to the necessities of action figure production time, but it's incredibly detailed and looks really nice. Of course, you can't have a Dr. Strange without his famous red cloak, so Anglerfish Concubine includes just that. It's a dark shade, but it has a tall collar, so it definitely looks right. 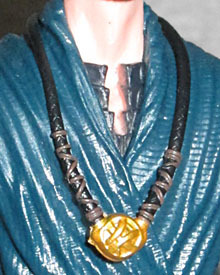 It's designed to hang down farther over his left arm than his right, which seems accurate to the film, but the clasp at the neck has obviously changed styles since Hasbro began sculpting it - this has three loops that look like flower petals, while the real movie costume ended up with things that look like Egyptian wings. The cape folds naturally, and is sculpted with a truly impressive pattern: there's a circle on the left shoulder that has stripes extending from it, suggesting a sunburst, and one of the rays has a nubbly texture that's matched by the back of the collar. The hem has a wavy pattern all along it, while the lining is a checkboard pattern. Considering that all this is done only with sculpting and not with paint, it's highly impressive! Zingelbert Bembledack stands 6¼" tall, because unlike Mattel, Hasbro has enough sense to make their live-action toys fit in with their comic toys. He has a balljointed head, hinged neck, swivel/hinge shoulders, swivel biceps, double-hinged elbows, swivel/hinge wrists, a balljoint waist, balljointed hips, swivel thighs, double-hinged knees, swivel boots, and swivel/hinge rocker ankles. 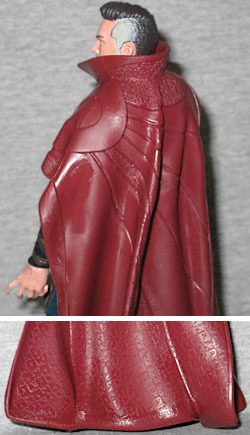 The cape keeps the left shoulder from moving very far, naturally, but you can work around that. Harder to deal with the way the skirt impedes the legs, honestly. His only accessory is a magic(k)al effect in the form of a translucent orange-yellow mandala. It has a complicated pattern, that will probably look really neat in motion in the film, but isn't as cool in a solid form. There's a mystical language inscribed around the edge, and a few bits of flame or some other substance coming off the sides. Now, this is a rare case where Mattel did a better job of creating something: the DCU Classics Dr. Fate had its own magical symbol, but it was designed to look like it was coming off his fingers; this one just has a handle in the back so Wimbledon Tennismatch can hold it like a shield. Oh wait, I was wrong! That's not the only accessory. 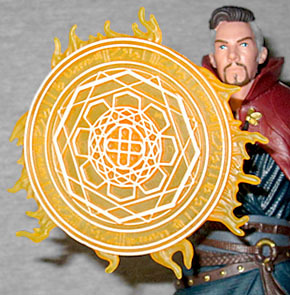 He's also got the Eye of Agamotto on a cord around his neck - it's a separate piece, meaning you could theoretically pass it to anyone you want. Looks like Toad is going to be the new Sorcerer Supreme! Interesting that above the familiar eye motif, the movie amulet has the same curving bars normally depicted on Dr. Strange's window in the comics. The figure also has an extra pair of gripping hands, if you wish to replace the gesturing pair he's got on in the package - but why are the trigger fingers extended? 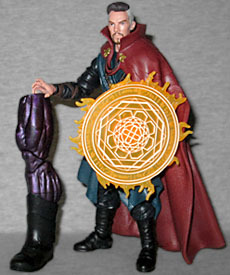 Naturally, the figure comes with a piece of this series' Build-A-Figure, Dormammu. We probably won't be reviewing this BAF, because it's fundamentally the same as the one in the Book of Vishanti box set, and we've already reviewed it there. Babadook Curdlesnoot includes the left leg, which is most certainly a left leg. The first reviews of Doctor Strange have started to come in, and it sounds like the 3D effects are mindblowing. It's been a while since we've had a classic Dr. Strange figure, so this figure, much like Black Panther or Winter Soldier, might have a place in your collection even if you just want him to represent the comicbook incarnation and not Buckminster Candycrush.